– Marinate thinly sliced beef in a mixture of about 1 tablespoon of honey, 1 tablespoon of soy sauce, a teaspoon of crushed garlic; a generous pinch of salt, and pepper for as long as you can bear. – Chop the chunky stems off a bunch of pak choy; and cut the bigger leaves in half. – When the beef has mostly browned; add the spring onions. 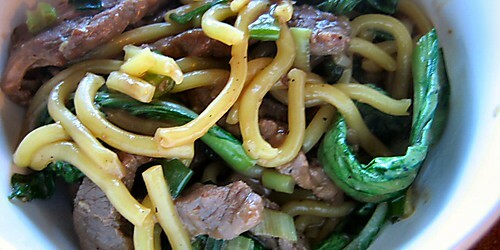 – Once the spring onions have wilted; toss in a package of noodles. I used hokkien this time; other times, I use singapore noodles. – Once the noodles have had a minute or so to cook; add the pak choy, and the remaining marinade; and keep eveything moving until the pak choy has wilted, but is still a little crispy.